I used colored pencils with Odorless Mineral Spirits to color the petals and leaves in. 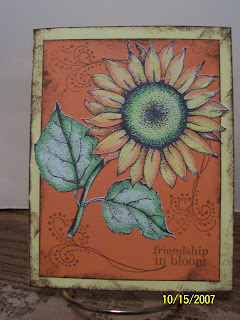 On a piece of orange Paper Place paper I stamped with my Palette Burnt Umber Ink Pad one of the swirl stamps from the Dots & Curves set which is one of the Dipsy Doodlin' Collection from inque boutique. I stamped a Friendship saying on it and also edged the paper with the same ink.